A TEENAGER from Frome is preparing for an expedition to the North Pole with the Scouts – and is busy working on helping to raise the £150,000 needed to finance the project. 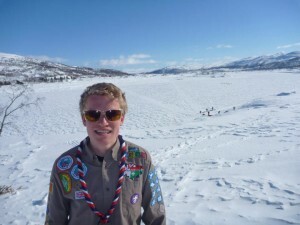 Chris Brown, 18, has been in the Scouts since he was 11 years old and has embarked on many adventures all over the world but none will come as big as a trip to the North Pole. He was picked from hundreds of applicants after a gruelling selection in Dartmoor and Norway. The expedition, entitled Scouts on the Pole, is expected to start in April 2014 dependent on weather conditions at the time and Chris will be joined by three other Scouts and organiser of the event, Wez Swain. The team will be guided by professional polar guide, Anthony Jinman who has been on 14 Arctic expeditions, many of which he has led. Chris said, “It is an absolutely amazing opportunity but the biggest hurdle remains – raising £150,000! We are working hard on this and need all the support we get and I know we won’t give up. “Originally I got told that I hadn’t been selected for the tour but I was first reserve. At this point I was gutted, but tried my best to move on. Then, out of the blue, I got a call from the organiser saying someone had dropped out. I was elated – especially as I thought the chance had gone. The team’s recent trip to Norway allowed the participants to have a taster of the temperatures of the North Pole which is expected to range from -20C to -35C. The expedition to the Pole is expected to take three weeks and Chris will be walking or skiing for between 8-10 hours a day pulling a sledge carrying equipment, fuel and food that will weigh around 70kg. Talking about the North Pole challenge his proud mum, Jane Brown said, “He has worked so hard to get to where he is and he has already been involved in many great trips. “The North Pole expedition will be a massive challenge but one that I’m sure he will achieve. I’m really proud of him and I think if he wasn’t in Madagascar he would be getting the message out to follow your dream and that anything is possible. If you would like to sponsor Chris or the team on their voyage or to find out more about what packages on offer call organiser Wez Swain on 07773 302854 or Wez@scoutsonthepole.com. Alternatively contact Chris himself after August 12th on 07815 975006 or christopherbrown337@gmail.com.